For more information, please visit the DMC-EV facebook page. We installed two 110/50W bifacial solar panels and a Plasmatronics PL40 solar regulator on this large Winnebago motor home. The solar panels are spaced above the white roof to allow light travelling around and through the solar panels to reflect onto the rear surface of the bifacial panel to produce additional power. 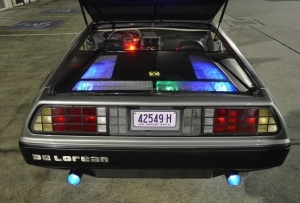 The space also allows air flow under the panel to reduce operating temperatures and increase power output. The 12V bifacial panels used in this installation are each rated at 110W on the front face and 50W on the rear face. 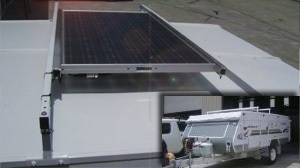 We installed a single 110/50W bifacial solar panel and a Steca 12A LCD solar regulator on this Jayco pop-top campervan. Utilising Jayco’s standard roof racks, the solar panel is spaced above the white roof to allow light travelling around and through the solar panel to reflect onto the rear surface of the bifacial panel to produce additional power. The space also allows air flow under the panel to reduce operating temperatures and increase power output. 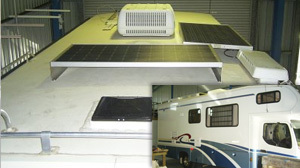 This motor home installation features Uni-Solar panels and a Steca PR2020 solar regulator. Our method of installation ensures that there are no water leaks and no solar panels flying off on the highway. Our custom brackets follow the contour of the roof to ensure a good, reliable bond. 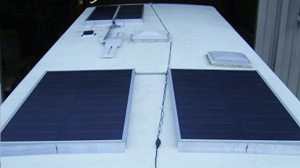 Uni-Solar panels are known for good performance in high temperature conditions.